2016 was a big year for Saw Gerrera! 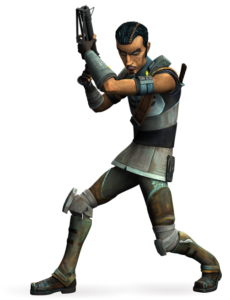 After having appeared in four episodes at the beginning of the fifth season of Star Wars The Clone Wars in the fall of 2012, Saw Gerrera had not re-appeared until 2016, in which he pops up several times. Saw Gerrera first appears in several episodes of the fifth season of Star Wars: The Clone Wars, where we see him as an anti-Separatist fighter on Onderon. In those episodes, we glean that he is brash, aggressive, a good fighter, fiercely loyal to Onderon, and not emotionally well-connected, amongst other character traits. 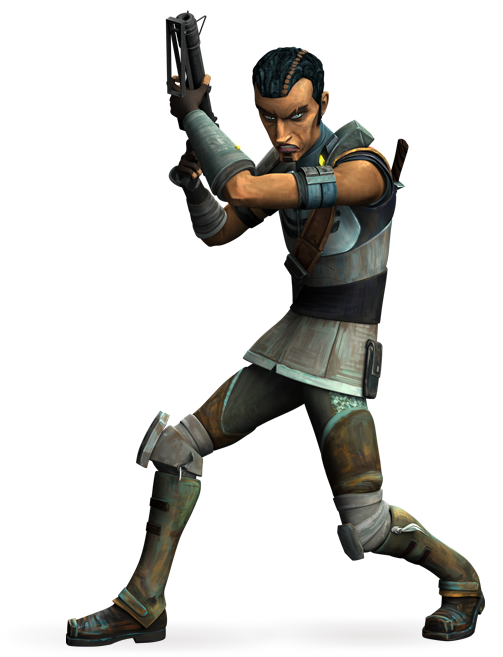 However, we don’t know what happens to him after the Clone Wars, once the Separatists depart from Onderon. Following those episodes of Star Wars: The Clone Wars, we don’t hear about Saw Gerrera until late in the second season of Star Wars Rebels (first aired in February 2016), when Agent Kallus describes an encounter following the Clone Wars trying to “bring peace and security” to Onderon. * Later on in 2016, we hear about “the campaigns of Saw Gerrera’s partisans” in Star Wars Bloodline (released in May 2016),** so we know that Saw Gerrera continued to not only fight against the Empire, but also led partisans who engaged in terrorism. Alongside Has was Saw Gerrera, doing the same at his own craft, shouting orders, organizing activities, making everything run smoothly and efficiently. “You told the Hiitian commander on Salient Two that you’d done this sort of thing before,” Has shouted to him between breaths. “Was it as bad as this?” Has asked, lifting his chin. When Saw Gerrera is introduced in this book, he simply seems like a boisterous denizen of a cantina, perhaps not being involved in any conflicts. By the end of the book, as we see in these interactions with the Ersos, it seems he gets inspired to take part in the rebellion against the Empire. Perhaps the spark was seeing what the Empire was doing, alongside Has Obitt, and fighting for Salient’s freedom against the Empire (as well as coming to discover that “more and more planets are being ravaged and sucked dry for resources”). Following this, he seems to be inspired to “play a part in exposing the Empire’s machinations” and that he needs to fight such injustice. Of course, it may be that Gerrera was itching to get back into fighting and didn’t know where, how, or why, following the end of The Clone Wars. But once sparked by what he saw, experienced, and heard, he knew that he needed to get involved in rebelling against the Empire. With his experience during The Clone Wars on Onderon, Gerrera is not only ready to fight whenever and wherever, but that he has a mind for strategizing and is talented at doing significant leading. And, of course, his is forthright, confident, and confrontational. This is the Saw Gerrera we see in Catalyst in the early years of the Empire, 17-18 years before he appears in Rogue One and 15-16 years before he appears in the recent Star Wars Rebels episode(s), “Ghosts of Geonosis”, which aired this month. He appears to be a sympathetic character, new to the rebellion. *** Is this before or after Agent Kallus is sent to Onderon? My guess would be that this book takes place before Gerrera takes part in the rebellion. 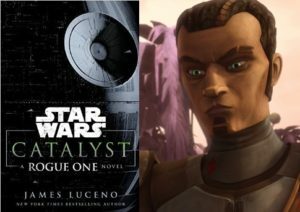 What We Discover About the First Order in “Star Wars Bloodline” “Before the Awakening” Provides Background On Three Central Characters in “The Force Awakens” What do we learn about Saw Gerrera from The Clone Wars? Why Does Lyra Erso Shoot Orson Krennic?